Each Pu'er Tea Cake Ripe Set is specially blended. This high quality Pu'er tea is made of sun-dried broad-leaf species from Yunnan, China. The sun dried tea leaves are ripened with a post-fermentation process that removes the astringent bite of the raw materials. Pu'er is rich in anti-inflammatory properties. Regular drinking promotes the lowering of bad cholesterol and reduction of blood sugar levels. Each TEASPEC Pu'er Tea Cake Ripe weighs 357 grams (12.5 oz) and comes with our elegant tea needle with a decorative walnut handle. 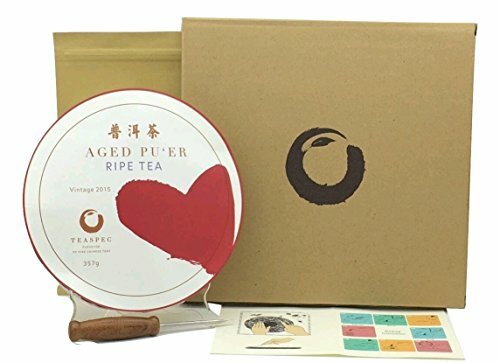 Each set comes with a resealable storage bag with silver foil lining making it the perfect size for storing your Pu'er tea cake once it is opened. Regular consumption of Pu'er has beneficial effects on lipid metabolism, triglycerides levels, total lipids and cholesterol levels. Pu'er: Hard to find outside of Asia - until now! If you have any questions about this product by TEASPEC, contact us by completing and submitting the form below. If you are looking for a specif part number, please include it with your message. Mocafe Thai Tea Latte, 3 Pound Can -- 4 per case.